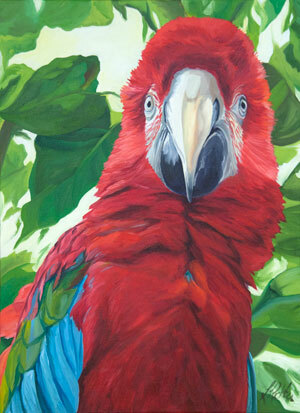 A red macaw has ruffled up his neck feathers and pulled his head back. His full attention is dead center and right on you. “Well?” he seems to ask, “What do you want?” He has not quite decided if you are bothering him yet. The red macaw is a Red-and-green Macaw, also known as the Green-winged Macaw (Ara chloropterus). The 2012 Richter Art Calendar is an art wall calendar featuring 12 images of Linda Richter’s oil paintings and Jake Richter’s digital paintings. Each month’s image is protected by a gloss varnish. This year we have added two mini-calendars for January and February 2013 at the back of our calendar for future planning. The 2012 Richter Art Calendar sells for US$6.95 and is available now at the Richter Art Gallery on Bonaire. The calendar is available via the on-line shopping site atwww.CaribbeanArt.com for those in North America and Holland. 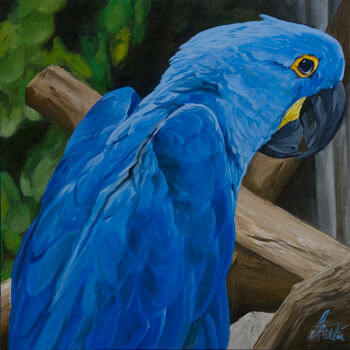 A friendly blue macaw looks over his shoulder with a nod and a wink. He is friends with the White Cockatoo. Gallery wrapped canvas with solid painted edges for hanging without framing. Signed limited edition prints are available in standard size 8×8″” print area $95.